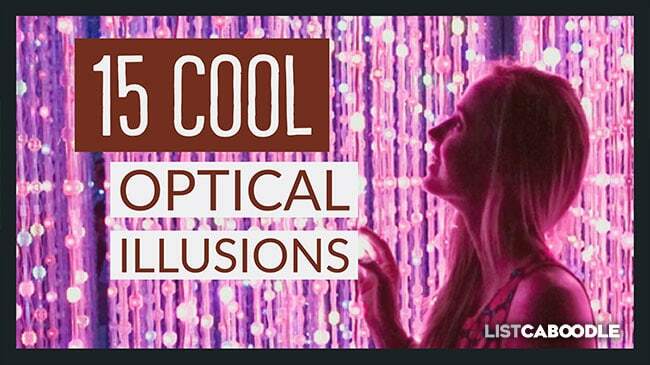 Optical illusions are usually two dimensional images that “trick” our eyes into seeing something that isn’t really there. This is because our eyes have evolved to function in the three dimensional world we live in. We are constantly making subconscious judgements of distance and space and shadows and light, in order to understand and navigate our world. An optical illusion image can present some of the same cues in a two dimensional plane, causing the eye and brain to interpret the visual information incorrectly. Take a look at some of the fun optical illusions below and see if your eye can be fooled too! This optical illusion is called motion aftereffect (MAE). As you watch the video, keep you eye at the center and read the letters as they form a sentence. After a short while you will be instructed to look away. This is when the magic happens! If you look at words on your screen, for example, they will seem to move in waves. Look around the room and you’ll see the same visual distortion. The effect lasts for only a few seconds but it is truly a unique experience. Motion aftereffect occurs when neurons adapt to constant movement and have to slowly adjust when the movement stops. The snakes start to move as you look at the image. This optical illusion works best if you keep your eyes moving around the visual of the circle patterns. As you look about the image, the discs—or snakes—appear to rotate and move. The illusion works because of microscopic eye movement called “saccades.” Interestlngly, when color is removed from the visual, less movement—and sometimes no movement—is detected. This indicates that color patterns and contrast has a lot to do in creating this illusion. 3. Catch the Snakes, Kitty! Watch this cat fall for the illusion. For cat lovers we present this cute feline staring at the same rotating snake illusion. She takes a good long look and starts to see the “snakes” start to move. Like any good hunter, it’s game on. Time to attack. But the snakes keep moving, and changing places. Hilarious! For more funny cat videos, check out this list of 10 funny cat videos for kids. Speaking of mesmerized cats… The word mesmerized is derived from the name of German physician Franz Mesmer, who discovered what he called “animal magnetism”—the natural transference of energy between animated and inanimate objects. The phenomenon was known as mesmerism in the late 1700s. The term hypnosis is more commonly used today, but has the same meaning. The power pop band OK Go is known for its quirky music videos. This video for The Writing’s On The Wall (from 2014’s Hungry Ghosts album) will truly test your visual skills. What seems real is not and everything morphs right before your eyes. The visual tricks are amazing, and all done in one take! 5. Aagh – I’ve Got a Hole in My Hand! A great idea for halloween or a zombie party. Here’s a simple trick you can try yourself without much expense. Just pick up some water-based, non-toxic paints and a brush. Start with a crude rendering of a hole and contour lines painted on the palm of your hand. Add more color and detail, depending on your artistic abilities. By painting a hole with the correct perspective, your hand will look like there is a hole right in the middle of it! Watch as celebrities become ugly! This is a really bizarre optical illusion! It’s called the flashed face distortion effect. Just watch the video and fix your eyes on the cross in the middle of the screen. You’ll see a series of famous celebrities appear to the left and right of the screen. Try not to look away from the cross, but use your peripheral vision to see the faces. Since the faces are familiar, you should recognize most of them. As the video progresses you should see the faces begin to distort and features exaggerate. Go ahead and watch the video without looking at the cross to prove to yourself that the distortions are just an illusion! Among the most famous illusionists is the great magician Harry Houdini. His tricks and illustions amazed fans in his day and are still used by today’s magicians. Other famous illusionists include early pioneers and innovators like David Copperfield and Doug Henning. Acts would change and evolve into more sophisticated illusions with contemporary artists David Blaine, Penn and Teller, and Lance Burton. This famous image goes back to the turn of the century where it was used in advertising and printed ephemera. It was called My Wife and My Mother-in-Law or sometimes referred to as the old hag and young woman. Take a look long enough at the picture and you should be able to see a young woman looking away and also an old woman in profile. Check out this funny spin on the old hag/young woman optical illusion, as performed by CollegeHumor. Just as you can flip between seeing a young woman and then an old woman in the famous illusion, these guys sometimes see a beautiful, young girlfriend and other times she appears to be old and haggard. The skit is reminiscent of the movie Shallow Hal where beauty proves to be in the eye of the beholder. 9. Are You Right Brained or Left Brained? Watch this video and find out if you are right brained or left brained. Is the woman spinning clockwise or counter clockwise? If you perceive her to be spinning clockwise, you are likely right brain dominant. If you see her spinning counter clockwise, you are probably left brain dominant. Right brained people tend to be more imagnative, artistic, intuitive, musical and emotional. Left brained people are more logical, fact-based, linear, verbal and mathematical. No, this has nothing to do with Monica Lewinski. This blue dress blew up the internet several years back because no one could say if it was really blue or just a white dress with black stripes. The truth is it was actually blue, but because of the lighting of the photo, some people saw it as a white dress. Check out this video for a more in-depth explanation of why some see blue and some see white. Take a look at this video and you be able to colorize a black and white image with your eyes. Just stare at the x in the middle of the screen. When the black and white image of the bikini model appears, you will see it in full color! Go ahead and rewatch the video to proove to yourself the second image is actually black and white. Flipbooks are a great way to demonstrate simple animation. In this video, holes have been punched in various spots on the pages. Watch as they come to life, creating a dynamic and interesting visual effect of motion. For all you would-be magicians out there, here is a classic slight of hand illusion you can easily learn and use to impress your friends. This trick is simple and a great ice breaker at the bar or social event. All you need is a face card from a normal deck of playing cards and a dollar bill. Check out the video to see the trick in action. Spoiler alert: you will find out how to perform the trick towards the end of the video. Its really quite easy and with a little practice you will be impressing your friends in no time! Here’s one for all the video gamers out there. Jump on board and enjoy this kaleidoscopic rollercoaster ride. Minecraft’s blocky environment shifts and turns and morphs into a grand visual trip, and you’re a virtual passenger. Minecraft was created in 2009 and is now the best-selling PC game ever. Watch as these two trains in India merge into one! One train approaches from the left side of the screen. Then you notice a second train coming in from the upper right. The paths of the two trains arc in such a way that the second train disappears into the first train. A great visual illusion you must see! Interested in exploring India? Here are 13 reasons to make India your next vacation destination.